Venice, Florence, Siena, Perugia, Assisi, Rome. Antica Ostaria Ruga Rialto on Ruga Vecchia s. Giovanni for some cicchetti. We found this cute little bar where some gondoleres were having beer in the bar and ended up for a sit down dinner in their restaurant. The place was small and homey. It is clearly on the tourist guidebooks as everyone in the restaurant section was a tourist. We had a mixed plate of cicchetti - sardines, octopus, a bit of fish, shrimp and an order of calamari fritti. Both were fine, the mains were spaghetti al Nero a very nicely done squid ink pasta with pieces of squid, and a pan fried sea bream topped with shrimp. The shrimp were just ok, but the sea bream was nicely cooked and fresh. La Furtola Restaurant a very nice little place, that was empty at 6:30, but filled with Italians within an hour. The servers were so nice and spoke little English, very charming. Started us off with a complimentary sparkling rose, perhaps because we dared eat at a completely empty restaurant. We had a Bollito of seafood which was prawns, big shrimp, little shrimp, the most tender calamari, octopus and a bit of dogfish, and some polenta with mini-shrimp on top. The polenta was so creamy and delicious, S thought it was just a thickened butter. Mains, were the chefs pasta which was a tagliolini, obviously freshly made, with mixed seafood and the grilled monkfish and fried vegetables. The monkfish was well cooked, but the vegetables were very tasty, barely battered, but crunchy and flavorful. The server suggested we get a mixed tasting of all their desserts, one torts with ricotta another limone a chocolate, and a blueberry. I liked them all except the blueberry. I'd definitely return. AI sportive pizzeria Lunched at a place in Santa Margarita Campo, behind one of the churches anchoring the campo. We had an o.k. rustic pizza w salami, artichoke hearts and black olives as well as a salad with artichoke hearts. I noticed their menu had several offerings of horse meat "strips" for pizza, the pasta at the next table looked pretty good, and this place was one of the cheapest we'd eaten at, only 7 euro for a pizza and the beer was 4 euro. Casa Nobile this cute little place with courtyard dining. The food was mediocre, we had a maccheroniti with squid that was a bit too salty and a whole branzino with potatoes artichokes and capers, that was simple and relatively flavorless. Bancogiro I thought the food was very mediocre and prices on the high side, but the canal side atmosphere was wonderful. Lots of folks hanging out in the nearby square and the dock drinking and picnicking. We had a cod carpaccio with a rucula salad and strawberries, a spaghetti Nero and a monkfish with some sweet and sour vegetables. We ended the night with a Venetian cream dusted with amaretto cookies. Wouldn’t return. Da Sandro Café good place to stop for cappuccino in a tiny square. Lupen e Margo a lampretto sandwich and trippa at a street stand outside, really good and spicy, tender, tho the bread was nothing to speak of. Il MagazzinoTripperia The waiter, though very nice, wasn't too helpful with recommendations. We went for an antipasto tripaio which was carpaccio of the cheek, the most tender meatballs made from offal and a piece of the heart. Lamprotto came with side pots of herbal salsa and hot pepper in a bottle. The homemade pasta carbonara di mare, a creamy seafood pasta dish was nice, though not particularly remarkable. Overall a good meal, with more down to earth prices, with wine and cover it came to only 40 euro. I Due Fratelli for a prosciutto goat cheese and rucula sand, mom had the pot betts, bread was better here than other places and wine is cheap. 'Ino a little sandwich shop near Uffizi, with good ingredients, though I have ton say I don't love the panino in Italy, the bread here is really poor compared to what I'm used to. I had a wild boar salami sand and she had a scarmoza and tomato sand. Scarmoza cheese was nicely melted from the toasting, but in general, I thought this place was just ok. I think I'd just as soon have one from Fratellini. Perche No Gelateria had some interesting flavors. They were still too sweet for my tastes, not the best, but better than the other calzuoili places. I tried fiore di latte with amarene, yogurt, and pistachio. Trattoria Marione worst meal, probably recommended based upon the low prices. On a brighter note, the Gelateria Lorenzo across the way, had some very nice gelato. I loved the cantada de ricotta flavor, a sweet ricotta with dried fruit found in spumoni and pannetone - well balanced, not overwhelmed by sugar. Closed in August: Procacci Truffle Sandwich Shop, Nerbone. Ended up grabbing a tripe sandwich at a little stand and grabbing some gelato at the Coronus place on Calzuoili near P Republica. I thought it was far too sweet, later got another gelato nearby lemon and yogurt, better though still quite sweet. *Il Caroccio off the campo. Nice pici pasta with a pork Ragu, I love pici's chewiness. I had the bistecca la CICCIA (not fiorentina), it was just o.k. Tried a spinach sformato topped with chicken livers, I enjoyed it but S found the livers too pungent. Dessert was a ricotta topped with cream and chocolate and also fruit topped with custard and whipped cream. Both obviously house made, but just o.k. I'd still return here for the pasta. Birra La Pizza in the walkway to the Campo near the Etruria hotel. Pizza pomodoro salciccia and stuffed pizza fromaggi and salciccia from Birra La Pizza in the walkway to the Campo fro, Etruria hotel. The stuffed pizza was pretty good. We picnicked on the campo and liked it enough to get some more for our backpack snacks the next day. Grom I actually liked their yogurt flavor and a crocante flavor, which i never liked in NYC. San Gimignano – I would not return to this town, it has interesting towers and architecture, but it is more a carnival for tourists than anything else. 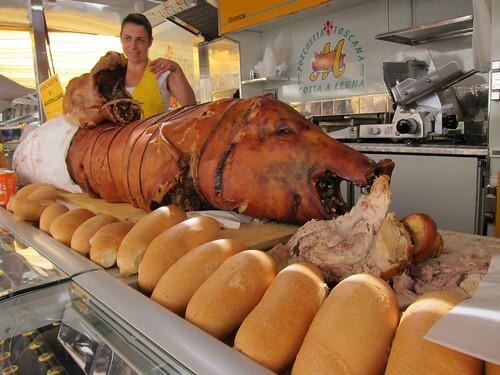 Grabbed some Porchetta from a street stand with a whole pig on a carving board that said "Porchetta di Montepuciano". It was fine if a bit salty. S also sampled the potato chip looking stuff sold every ten steps in the market, which she said was dry and not that interesting, so we got some candied hazelnuts and peanut brittle instead. Good candied hazelnuts. *Osteria Coccode with a chalkboard showing umbricelli trota i tartufo, just the sort of regional cooking I was looking for. We settled on Tagliatelle Ragu all a Umbria and a Umbricelli Norcia, a cream sauce with sausage and norcia truffle that was only nine euro. This was the new best pasta of the trip. Umbricelli turned out to be a thick spaghetti similar to pici. The sauce was perfect not too creamy really well balanced with little morsels of pork sausage and flecks of black truffle. 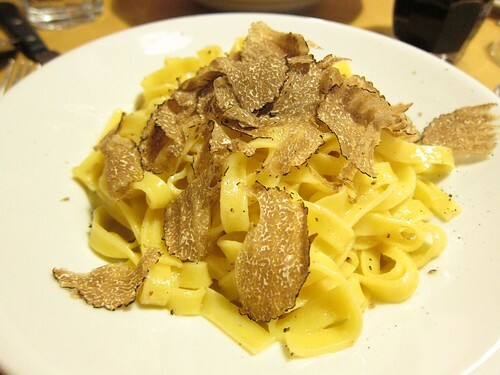 The dish had a strong truffle aroma and flavor. Loved loved loved it. The Rugula Salad was fine, just some rucula, and the fruit tart dessert was definitely an after thought, probably bought in by the restaurant. We spied a very good looking steak on another table and agreed we should come back for dinner again. A half liter of house white and the bill came to thirty eight euro, best value of the trip. Such a good eating day, I kept proclaiming how happy I was. At our second dinner the umbricelli alla norcina was delicious, but the pork cutlet covered in mushrooms was a disappointment, undercooked pasta and a thick goopy sauce that was sort of what you’d get in a cafeteria. So, ordering carefully is important. La Fortezza Lunch at a Micheline place, with excellent service and decent food. We had the ravioli stuffed with spinach and ricotta in a pesto, and a strogarizzi with tartufo. The ravioli were good and the strogarizze were a shade too al dente, though the sauce was delicious full of mushroom and truffle flavor. I’d eat here again. Gelato a half a block up from hotel fortuna - cassata di sicialiana and pinoli, was actually pretty good. *Da Remo - Pizza As we approached there was already a huge crowd waiting. We put our names in and the guy said 20 minutes. We waited for an hour, but enjoyed the completely Italian crowd of couples and families waiting for their turn. Got a fried bacala which was great, if salty, nice crispy on the hard side, fish! Then a 30 min wait for a marg, diavola, and a zucchini flower w anchovy pizza (bianca) Loved the marg and the pizza zucca, crispy super thin crust with a great balance of toppings. The beer and the warm summer night atmosphere of the crowd was awesome. *Flavio di Valdovetto for lunch, very friendly service and dines in a ac room with a view of the ancient walls. We ordered carbonara, recommended by the server, and the house ravioli with spinach, ricotta, herbs and cream. A fried squash blossom and a mixed salad. And importantly a half liter of house red which lead us to a two hour siesta later that afternoon. The ravioli was delicious as was the carbonara, it had a lot of delicious chunks of meat and was a wetter style than Perilli. I would definitely return. Il Gelato Very good, G had sesame almond, and al morra (blackberry) with panna, I had il Gelati fantasia, which was pinoli pistachio and orange, along with yogurt and bosco (berries), both good a little less sweet than other places and full of flavor. Walkable from Perill, but in an area without much commercial activity needed to walk a bit to take a taxi back. Testaccio Market We went early so it busy with a lot of local people doing their weekly shopping. We found a stand where a lot of older Italian ladies were shopping. The other people shopping were really nice to let us jump ahead because we were only buying a few pieces of fruit. On our way out of the market, we stopped by the butcher and after an enthusiastic round of giving us tastes, we ended up with a whole sweet salami, a small spicy salami and two balls of buffalo mozz for 21 euro, hmm that seemed steep. 00100 a pizza pocket place, good a/c and interesting trapezzino with coda vacherri (oxtail stew). 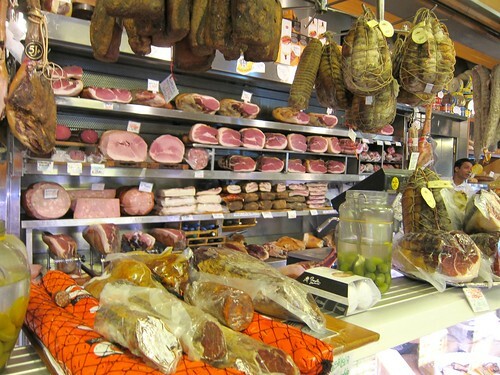 *Volpetti a gourmet provisions shop full of prepared foods and cheeses. Great store and generous with giving a lot of samples – they know how to hook you! Perilli we were in a super old school place served by a man who was perhaps 75 years old wearing a tux with a back brace shuffling around. Something about it reminded me of a Woody Allen movie. 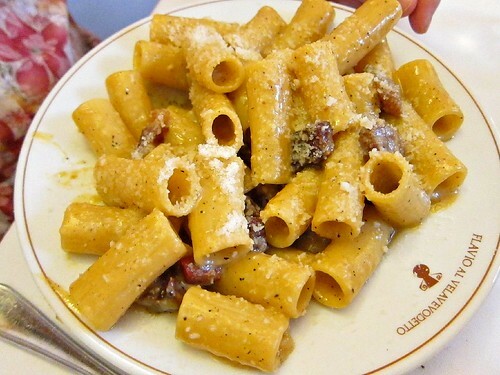 We ate carciofi all a Romana, rigatoni carbonara the best I've had, rigatoni pajata and acchiobacco (intestines and lamb). 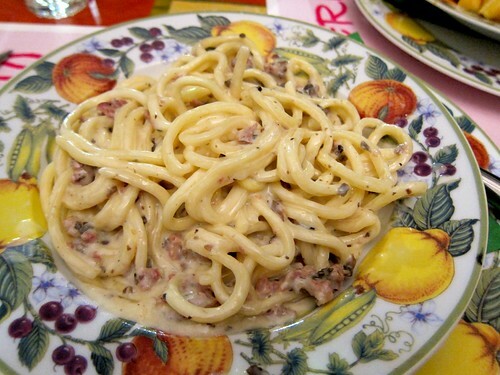 The carbonara was outstanding. A bit of sautéed chicory and roasted lamb with potatoes, great lamb very tender and gamey, trippa romana which was stewed tripe in a tomato sauce with Romano cheese on top. Both very good, though the lamb a bit more special. I prefer the florentine tripe prep. Forno Campo di Fiori for pizza bianca that was excellent, you tell them how much to cut for you off of a big piece, and we got a fresh one from the back. Bravo. We picnicked at Piazza Farnese then headed to Trastavere. Gelato place on our way to Trastavere right before the Garibaldi bridge, not great and they tried to over charge us. Roscioli Started with burrata and despite its dop label and 17 euro price tag the best part of the dish was the dried tomatoes on top and the delicious Marfuga olive oil. Then came rigatoni amatriciana and a spaghetti with anchovies capers in a tomato sauce. The amatriciana was ok, nice bits of meat, not memorable, spaghetti was just o.k. 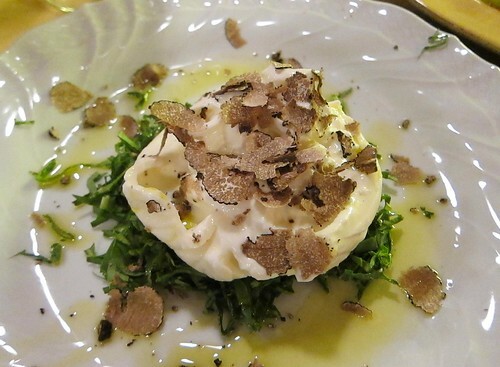 The whole thing was overpriced and considering that the burrata should've been their strong suit, and the one at I had at Cipolla Rossa was much better, I would not return. 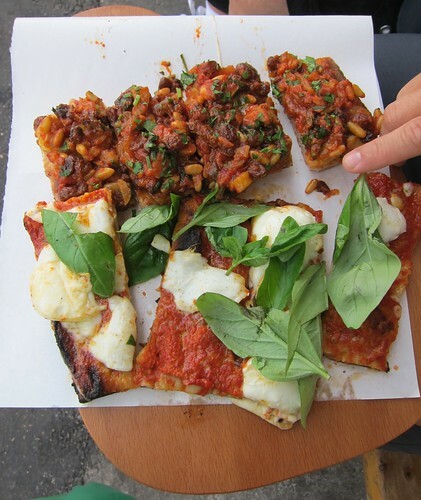 Forno La Renella – cute little neighborhood pizza place with good ingredients. Cafe next to the one that had a sign that said "we are against war and tourist menu." We got free wifi (with a ridiculously long and convoluted password) and some very refreshing prosecco with strawberry spritzers. St Eustachio for cappuccino and a cream filled cornetti. 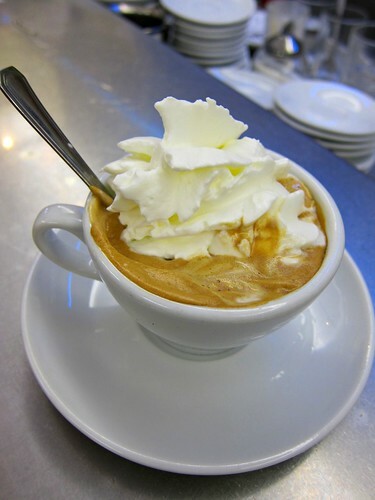 I had gran cafe con panna - delicious. Wine Bar nr CDF - I had an artichoke and grace an anchovy stuffed pepper. Nice wine bar. Sora Margarita in the Jewish Ghetto and had a nice meal of spaghetti caio e peppe and carciofi alla giudea (fried artichoke) and fiori di zucca and agnolotti in a meat sauce. Nice neighborhood hole in the wall. Would definitely return but I think the their homemade pasta with ricotta and pepe is probably a better bet than the cacio e peppe. Pizzarium near the Vatican. Pizza tagliolini, we tried Marguerita with basil, a caponata of eggplant tomato pine nut and raisin and an anchovy with some type of green, all good , though I liked the Margarita the best. Gracchi a gelateria near the Vatican. Good. *Taverna de Fori Imperiale near the Coliseum. The dining room is charming, cellar like with arches but very warm lighting and fun tiny red checked table cloths reminding you that as nice and somewhat upscale the surroundings, this is a taverna. The menu if the day consisted of a house made spaghetti fruiti di mare with an eggplant antipasti, mussels, clams, shrimp and lobster, two types of ravioli one stuffed with bureaus and ricotta and the other stuffed with meat and covered in a truffle sauce, there was a gnocchi and a special carbonara with some beans or other items mixed in. We opted for the spaghetti and the two ravioli dishes. The spaghetti was a familiar flavor, a generous amount of seafood and excellent pasta noodles. The Raviolis were my favorite, the burrata and ricotta was a perfect blend, though a bit of the texture of the burrata was lost in the cooked format, nice simple tomato sauce to balance it out. My favorite was the ravioli with sausage and truffle sauce, this reminded me of the pastas in Umbria, the umbricelli all a norcina so good and possibly the best food experience of the trip. Grilled boar topped with a blueberry juniper berry sauce, a sweet and sour flavor. 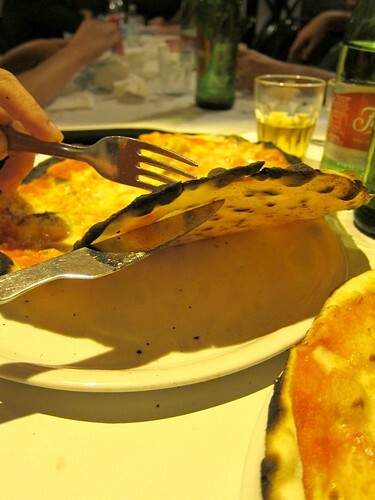 We went for it and ordered the swordfish Sicilian style off of the regular menu. Chicory was the vegetable of the day, we went for a grilled radicchio. We ordered another half liter of wine, this time the house red, they offered a chilled version, but we went for regular. Out of the secondi, I liked the boar, a chewy slightly gamey pork chop like piece with the look of a small beef steak. The juniper berry sauce matched it perfectly slightly sweet and acidic, accompanying the chop was bit of rice, the sauce was delicate enough to go on the rice and the boar bringing everything together. Loved it. The swordfish was a smallish piece and Just o.k. The radicchio was surprisingly bitter. I was ready for dessert, but mom was tuckered out almost falling asleep at the table. The whole kit and kaboodle was 97 euro. For me, this was an exceptional meal. We skipped dessert and went outside to find rain. The chef who must've been taking a break outside came upon us, I told him molto buono and he was very gracious. He went in to call us a cab. Urbana 47 in Monti which had surprisingly modern Italian food. I had a Malfatti pasta with arugula pesto and green beans. Then a Pollo alla Romana two pieces of chicken the thigh and the leg with roasted red and yellow peppers on the side were simple and delicious, presented in a setting and style similar to what I get in SF. Also had an interesting Roman beer which came in red or white version, I opted for the white and it was very happy. Closed: Trattoria Monti, L'Asino D'Oro, Da Baffeto.